ORLANDO, FL--(Marketwired - April 05, 2016) - uBreakiFix specializes in same-day repair service of small electronics, repairing cracked screens, water damage, software issues, camera issues and other technical problems at its more than 185 stores across North America. Its newest location, uBreakiFix Royal Oak, opened April 5 at 30274 Woodward Ave.
uBreakiFix Royal Oak is the first uBreakiFix location in Michigan, though it is not the first store for owners Drew Lessaris and Ron, Joyce and Matthew Harb. 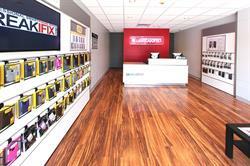 The franchisees have been a part of uBreakiFix for more than two years and have existing stores in Indiana and Arkansas. The Harbs are Detroit natives, and Lessaris recently moved to Michigan to begin opening stores in the area alongside of them. The team is excited to provide the greater Detroit area with affordable and reliable tech repair options and plans to open 15 additional uBreakiFix stores in Michigan in the coming years. "Expanding uBreakiFix to Michigan means being able to provide this community with a one-stop shop for all its technology repair needs," Lessaris said. "We are beyond thrilled to start raising awareness of technology repair in Michigan through our incomparable customer service, industry knowledge and price-match guarantee." ​uBreakiFix specializes in same-day repair service of small electronics, repairing cracked screens, water damage, software issues, camera issues and other technical problems at its more than 185 stores in North America. uBreakiFix Royal Oak opened April 5.